Location of Mono within Dufferin County. The Town of Mono is situated in south-central Ontario, Canada, at the south-east corner of Dufferin County. It stretches from Highway 9 along its southern border to Highway 89 along its northern border. Its border to the west is with the Township of Amaranth and in the east it is bordered by the Township of Adjala-Tosorontio. It was previously known as the Township of Mono. Mono is a rural community in both geography and character. It has a wide variation in topography, being composed of mostly rolling, tree-covered hills. It holds many streams and creeks which form the headwaters of three rivers - the Humber River, Nottawasaga River and Credit River and most of the town is located on high land relative to the rest of Southern Ontario. This leads to its current slogan of 'the heart of the headwaters'. Mono's residents live on farms, rural estates and in small settlements. Mono Centre, Hockley Village and Camilla are just some of the small communities which exist within the Town of Mono. Mono's population represents many different backgrounds, including the farming community, local businesses, numerous artists and artisans, commuters to neighbouring towns and cities, and weekend escapees from the urban bustle. When "Simcoe District" was formed in 1843 by the Legislative Assembly of Upper Canada, it contained 19 original townships. Simcoe District was restructured in 1845, changing its composition to 24 townships including the Township of Mono. Effective January 1, 1850, An Act for abolishing the Territorial Divisions of Upper Canada into Districts abolished Simcoe "District" in favour of the Simcoe "County", still composed of the Townships noted in the Act of 1845. 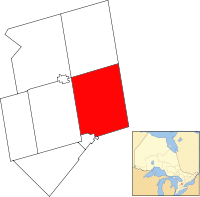 The "Provisional County of Dufferin" was initially organized as authorized by the Legislative Assembly of Ontario in 1875 and the actual formation taking effect in 1881, from parts of the counties of Grey, Simcoe and Wellington Counties. The Township of Mulmur and the Township of Mono were transferred from Simcoe to Dufferin in 1881. The 2001 population was 6,912 when adjusted according to the 2006 boundaries of the town. Mono Cliffs Provincial Park is one place where the Niagara Escarpment puts out a dramatic appearance. The dominant features of the park are three Escarpment outcrops known as the Mono Rocks. The Toronto District School Board operates an outdoor education and conference centre located within the park. Also, the Bruce Trail goes through this area, linking it to the nearby Hockley Valley Provincial Nature Reserve. The Hockley Valley itself is a popular destination for tourists in the fall wishing to take in the changing colours of the leaves in autumn. Outside of the Bruce Trail, there are several parks and the Niagara Escarpment is a UNESCO protected Biosphere reserve, one of only 12 in Canada. There are several recreational attractions in the region as well. The Hockley Valley Resort is located on the 3rd Line of Mono. The Hockley Valley Resort has both a golf course for activities in the summer and a popular ski resort for winter get-aways. There are also cross country skiing trails at Monora Park. There is much debate between residents and non residents as to the correct way to pronounce the name Mono, the correct way is mow-no. The Indian name Mahnoo, means "let it be so." The original name was Monadh (Irish pronounced it Monaah and later residents, Mowna) named by the Irish potato farmers who came to these higher elevations to get early crops. There are several historic hamlets or villages in the Town of Mono. They include Camilla, Elba, Relessey, Mono Centre, Glen Cross, Granger, Hockley and Blount. The first woman lawyer in Canada, Clara Brett Martin, received her elementary education at Perry's School built in 1866, located in the Hamlet of Blount in South Mono. The Hamlet's post office was established in 1888 and the first postmaster was William Woods. James Cameron, the director of the 1997 film Titanic, spent time in his childhood in the Caledon region to the south and still has family there. As a tribute to his youth, he named the villain in Titanic, Caledon Hockley, after both Caledon and the Hockley valley area. The Wingfield Series of plays is set in a fictional small town in Ontario called Persephone Township. Many of the jokes and personalities are taken from, among other sources, Mono Township. For example, the debate over the pronunciation of Persephone reflects the debate over the pronunciation of Mono. Playwright Dan Needles created the character while working in Shelburne, Ontario. Portions of the TV series Schitt's Creek are filmed at a motel located in Mono. ^ a b "Mono, Ontario (Code 3522012) census profile". 2011 Census of Population. Statistics Canada. Retrieved 2012-08-14. Wikimedia Commons has media related to Mono, Ontario. This page was last edited on 23 February 2019, at 14:13 (UTC).